USES: Albuterol (also known as salbutamol) is used to treat wheezing and shortness of breath caused by breathing problems such as asthma. 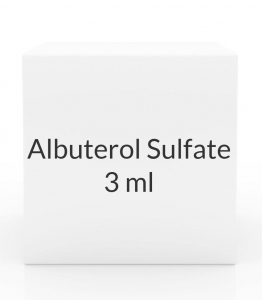 Albuterol belongs to a class of drugs known as bronchodilators. It works in the airways by opening breathing passages and relaxing muscles. Controlling symptoms of breathing problems can decrease time lost from work or school. HOW TO USE: Read the Patient Information Leaflet provided by your pharmacist before you start using this medication and each time you get a refill. This medication is used with a special machine called a nebulizer that changes the solution to a fine mist that you inhale. Learn all instructions for the use of this medication and the nebulizer. If a child is using this medication, a parent or other responsible adult should supervise the child. If you have any questions, consult your doctor, pharmacist, or respiratory therapist. This product should be clear and colorless. Before using, check this product visually for particles or discoloration. If either is present, do not use the liquid. This medication does not require any mixing before use. Using a mouthpiece or face mask with the nebulizer, inhale the prescribed dose of medication into your lungs as directed by your doctor, usually 3 or 4 times daily as needed. Each treatment usually takes about 5 to 15 minutes. Use this medication only through a nebulizer. Do not swallow or inject the solution. Do not mix with other medicines in your nebulizer. To prevent infections, clean the nebulizer and mouthpiece/face mask according to the manufacturer's directions. Dosage is based on your medical condition, age, weight, and response to treatment. Do not increase your dose or use it more frequently than prescribed without your doctor's approval. Learn which of your inhalers/medications you should use every day and which you should use if your breathing suddenly worsens. Ask your doctor what to do if you have worsening cough or shortness of breath, wheezing, increased sputum, or worsening peak flow meter readings. Learn when you can self-medicate and when you should get medical help right away. SIDE EFFECTS: Nervousness, shaking (tremor), headache, nausea or dizziness may occur. If any of these effects persist or worsen, tell your doctor or pharmacist promptly. Remember that your doctor has prescribed this medication because he or she has judged that the benefit to you is greater than the risk of side effects. Many people using this medication do not have serious side effects. Tell your doctor right away if you have any serious side effects, including: fast/pounding heartbeat. Get medical help right away if you have any rare but very serious side effects, including: chest pain, irregular heartbeat, rapid breathing, confusion. Rarely, this medication has caused severe (rarely fatal), sudden worsening of breathing problems/asthma (paradoxical bronchospasm). If you experience sudden wheezing, get medical help right away. A very serious allergic reaction to this drug is rare. However, get medical help right away if you notice any symptoms of a serious allergic reaction, including: rash, itching/swelling (especially of the face/tongue/throat), severe dizziness, trouble breathing. This is not a complete list of possible side effects. If you notice other effects not listed above, contact your doctor or pharmacist. In the US - Call your doctor for medical advice about side effects. You may report side effects to FDA at 1-800-FDA-1088. In Canada - Call your doctor for medical advice about side effects. You may report side effects to Health Canada at 1-866-234-2345. PRECAUTIONS: Before using albuterol, tell your doctor or pharmacist if you are allergic to it; or if you have had a serious reaction to similar drugs (such as metaproterenol, terbutaline); or if you have any other allergies. This product may contain inactive ingredients, which can cause allergic reactions or other problems. Talk to your pharmacist for more details. Before using this medication, tell your doctor or pharmacist your medical history, especially of: heart problems (such as irregular heartbeat, angina, heart attack), high blood pressure, diabetes, seizure. This drug may make you dizzy. Do not drive, use machinery, or do any activity that requires alertness until you are sure you can perform such activities safely. Limit alcoholic beverages. Before having surgery, tell your doctor or dentist about all the products you use (including prescription drugs, nonprescription drugs, and herbal products). During pregnancy, this medication should be used only when clearly needed. Discuss the risks and benefits with your doctor. It is unknown if this medication passes into breast milk. Consult your doctor before breast-feeding. DRUG INTERACTIONS: Drug interactions may change how your medications work or increase your risk for serious side effects. This document does not contain all possible drug interactions. Keep a list of all the products you use (including prescription/nonprescription drugs and herbal products) and share it with your doctor and pharmacist. Do not start, stop, or change the dosage of any medicines without your doctor's approval. OVERDOSE: If overdose is suspected, contact a poison control center or emergency room immediately. US residents can call the US National Poison Hotline at 1-800-222-1222. Canada residents can call a provincial poison control center. Symptoms of overdose may include: fast/pounding/irregular heartbeat, severe shaking (tremors), seizures. NOTES: Do not share this medication with others. Laboratory and/or medical tests (such as a lung/breathing test, blood pressure) should be performed periodically to monitor your progress or check for side effects. Consult your doctor for more details. Avoid allergens/irritants such as smoke, pollen, pet dander, dust, or molds that may worsen breathing problems. Learn to use a peak flow meter, use it daily, and promptly report worsening breathing problems (such as readings in the yellow/red range, increased use of quick-relief inhalers). Ask your doctor or pharmacist whether you should have an annual flu shot. MISSED DOSE: If you are using this medication on a prescribed schedule and miss a dose, use it as soon as you remember. If it is near the time of the next dose, skip the missed dose and resume your usual dosing schedule. Do not double the dose to catch up. STORAGE: Different brands of this medication have different storage needs. Check the product package for instructions on how to store your brand, or ask your pharmacist. Do not store in the bathroom. Keep all medications away from children and pets. Keep the vials stored in the foil pouches until ready to use. Once the vials are removed from the foil pouch, use them within 7 days. Discard any unused portions of the vials. Do not flush medications down the toilet or pour them into a drain unless instructed to do so. Properly discard this product when it is expired or no longer needed. Consult your pharmacist or local waste disposal company for more details about how to safely discard your product. MEDICAL ALERT: Your condition can cause complications in a medical emergency. For information about enrolling in MedicAlert, call 1-800-854-1166 (US) or 1-800-668-1507 (Canada).